Bearsden tennis player Ewen Lumsden rounded off a highly successful year when he was named Tennis Scotland’s junior player of the year. The 15-year-old was revealed as the winner at the organisation’s agm after a year which saw him make an impact at national and international level. The highlight was lifting two silver medals at the multi-sport Commonwealth Youth Games in Samoa in September. He was runner-up in the boys’ singles - only losing out to India’s top seed Sasi Kumar Mukund, three years his elder - and in the mixed doubles with partner Louie McLelland, from Stirling. He also teamed up with a Cypriot player to win the non-medal boys’ doubles and such were his exploits that he was named Youth Team Scotland’s Athlete of the Games in the event which featured nine different sports. Ewen also won the Scottish Junior Open in July and reached the final of the Scottish National Championships senior men’s singles, losing to Bridge of Allan’s Vincent Gillespie only after winning the first set 6-1. Originally from Bearsden, until the family moved to Lenzie, Ewen has been playing the game since he was six or seven and comes from a tennis family - older sister Maia (17) is also a successful player. He was mostly coached at the David Lloyd Centre at Anniesland in his earlier days but now trains at Stirling University. He attended Mosshead Primary in Bearsden, but rather than move to Bearsden Academy he switched to Beaconhurst. a school next to Stirling University. Mum Gillian says that has allowed him to combine his studies with the global travelling necessary to try to further his tennis career. She said: “Ewen doesn’t play much in domestic tournaments, but mainly travels the ITF circuit playing throughout the world. “One of the reasons he moved to Beaconhurst was because they take that into account and he can use online learning to continue his education. 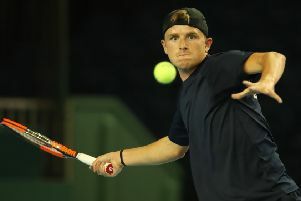 “At the moment his aim is to continue to play the tournaments and get his ITF ranking up to allow him to play in higher tournaments and the junior slams. Unsurprisingly, Scotland’s current superstar Andy Murray is major influence on Ewen - and like the world number two his speed around a tennis court is seen as one of his main assets. Ewen is top seed at this week’s Scottish Junior Indoor Championships at Scotstoun.